PRM. The power of precision. In September of 2001, the current PRM president, Todd Dinner purchased a company called Signature 2000. At the time the only product offered was the Signature-Fit custom molded seating line. Signature 2000 was the first company to offer digitizing (1978) versus time-consuming plaster casting. As the company evolved, two additional product lines were added — Precision-Fit(2004) custom measured cushions and Contoured-Fit (2007) off-the-shelf cushions. These product lines complimented the popular Signature-Fit custom molded product. Today, we have a staff that helps support our customers through the buying cycle from start to delivery. We also have independent sales representatives to promote PRM products in the field. For more information, please contact PRM at 814-899-8731. At PRM, it is our mission to become the leading rehab seating manufacturer and maximize value for our customers through technology and the dedication of our associates. Our vision is to provide our customers with superior value — while exceeding customer expectations — as a market leader in custom seating. Dealers will use PRM because we save them time and are responsive to their needs. Therapists will request PRM because they know it is a company that builds a quality product and will stand behind the product after the sale. PRM — through Signature 2000 — was the first company in the industry to digitize. In 2007, PRM introduced Insight, the first stereo vision camera used to digitize shapes. This system used a stereo vision camera which took a picture and provided over 6000 data points per seat or back. Digitizing has evolved yet again with the use of the current Sense digitizer —a handheld scanner that draws the shape within minutes. 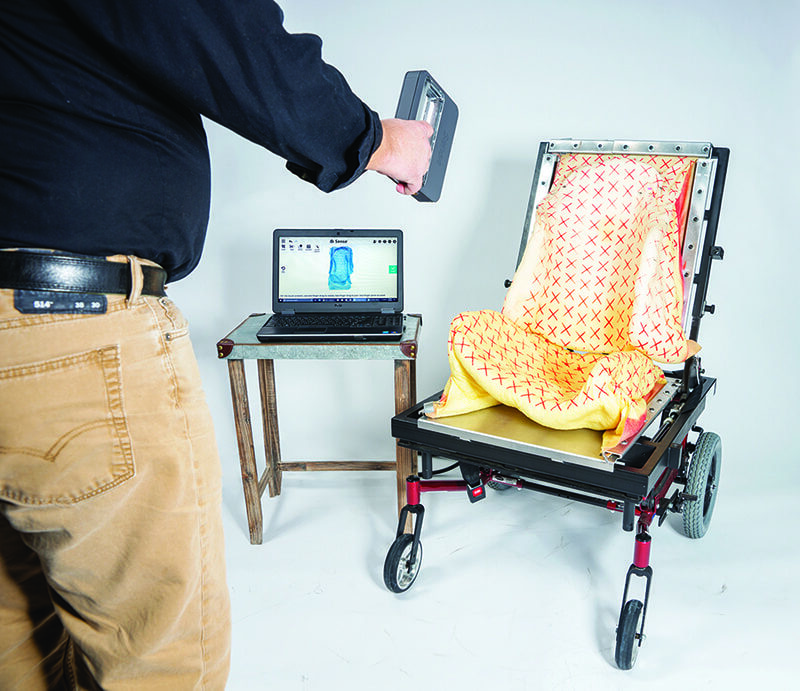 This scanner improves the accuracy of the digitized image, which translates to better fitting cushions for our clients, and saves dealers time to capture an image and improve lead-time for finished products. The 3DSystems Sense™ digitizer is extremely easy to use and provides accurate shape capture within a few minutes. Contact PRM, Inc. for more information or to obtain your own Sense scanner. To schedule a training, call 814-899-8731 or send us an email.